In this post we will give more information about the performance indicator “takt time improvement suggestions”. Other performance indicators for continuous improvement are described here. The best performance indicators of continuous improvement are lower cost, shorter leadtime and improved quality. Takt time (a typical Lean term) is the rate at which a finished product needs to be completed in order to meet customer demand. For example, if a customer wants 10 units per week, then, given a 40-hour work week the takttime is 4 hours. 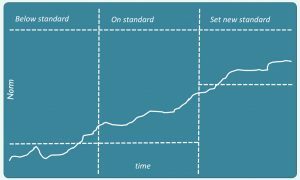 Takt time can be applied to the continuous improvement process.